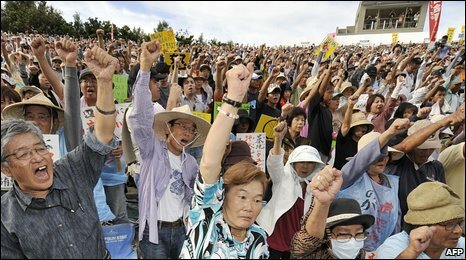 Thousands of people have protested on the southern Japanese island of Okinawa demanding the removal of a US military base there. The local mayor called on new Prime Minister Yukio Hatoyama "to put an end to Okinawa's burden and ordeal". Japan and the US agreed in 2006 to relocate the Futenma base from an urban area to reclaimed land but the PM's election has rekindled opposition. The protest comes ahead of this week's visit by US President Barack Obama. The BBC's Roland Buerk in Tokyo says the row over the relocation of the base threatens to sour relations between Japan's new government and the country's key security ally. Foreign Minister Katsuya Okada warned it was unlikely to be resolved before Mr Obama arrives in Japan on Friday. Japan's new government has expressed a determination to have a less subservient relationship with the US. Organisers of the protest claimed 21,000 people took part. Mayor of Ginowan, Yoichi Iha, told the rally: "I urge Prime Minister Hatoyama to tell President Obama that Okinawa needs no more US bases." One protester, Yoshiko Yonamine, told AFP news agency: "Okinawans voted for the new administration, thinking it would remove the base from the island. I don't want it to betray us." 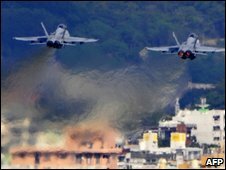 The base is in a busy city centre and amid local concern about noise, pollution and crime the two countries agreed in 2006 to move it to reclaimed land on Okinawa's coast. But, our correspondent says, there is opposition to the new site too because of possible damage to coral reefs. Okinawa is host to about half the 47,000-strong American force in Japan. Mr Hatoyama, whose election in August ended more than half a century of conservative dominance, has suggested the base could be moved off the island, or perhaps out of Japan altogether. The US insists Japan honour the 2006 agreement to move to the coastal Camp Schwab area. The agreement would see Japan fund the replacement base and the transfer of 8,000 US marines to Guam by 2014.